A revolution is occurring across campuses at American universities. Students are demanding accountability and action against structures of power that continue to oppress minority groups. University administrations that not only tolerate cultural appropriation, but also encourage racially discriminatory actions still exist. Several individuals of the millennial generation wonder what their role would be had they been alive during the civil rights era. However, the wonder is no longer excusable for inaction, as the fight for civil rights for people of color is reignited. There is an ongoing campaign to increase awareness of the harmful nature of microaggressions made by individuals who may or may not be privileged with social power (see fig. 1). 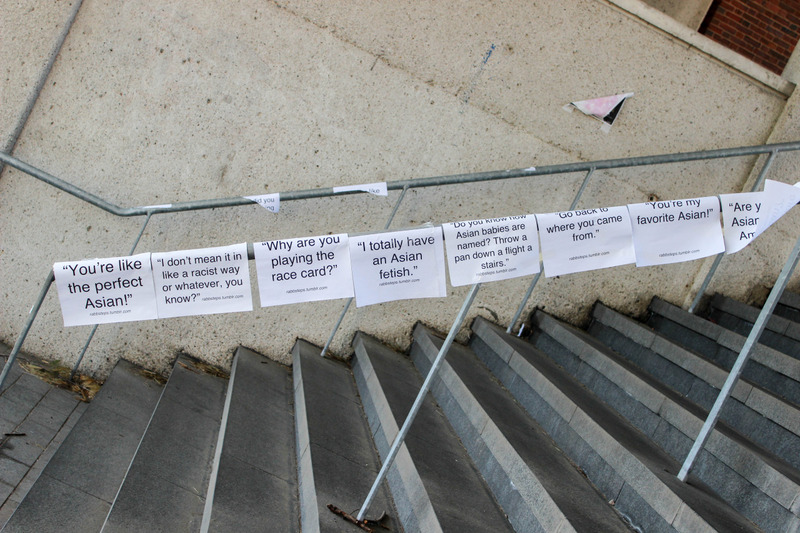 Students of color, along with allies in solidarity, are exposing the destructive nature of microaggressions. They are encouraging their student bodies along with faculty and staff to think in a critical fashion about the intent, nature, and effects of their conversations. However, adversaries of speech policing are accusing universities of a deleterious censorship that negatively coddles students from the harsh reality they will likely face once they receive their diploma. Opponents argue that monitoring is “creating a culture in which everyone must think twice before speaking up, lest they face charges of insensitivity, aggression, or worse” (Haidt). Figure 1. Brandeis University Asian/Asian-American Microaggression Demonstration. The conflict lies in the distinction between protecting individuals from triggering statements that may cause traumatic emotional and psychological responses and ensuring that college students are constructively engaging in the discriminatory ideas that permeate throughout society. Considering the imperative nature of this debate, it is critical that all arguments are presented in such a way that fosters productive discourse and action rather than ineffectual quarrelling. Therefore, I propose a set of guidelines to facilitate this conversation to unearth the best possible actions as a single solution is unlikely in this debacle of freedom. Danielle Allen, a political theorist known for her work on justice and citizenship in both ancient Athens and modern America, draws from key philosophical treatises by Hannah Arendt and asserts that the necessary foundational rules of this discourse must be deliberation, prophecy, and advocacy (Allen). In this paper, I will explore how the role of the university in sparking intellectual vitality conflicts with fully monitoring racial microaggressions and how Hannah Arendt’s and Danielle Allen’s foundational virtues may guide the burgeoning protests around college campuses in their search for liberation. With the rise of social media and the first true generation of digital natives, the relationship between the media and social movements continues to evolve as more individuals are engaging in the public sphere. The ideology Hannah Arendt expresses defines the public sphere as “where citizens are able to meet one another, exchange their opinions and debate their differences, and search for some collective solution to their problems” (D’Entreves). Therefore, it is important to recognize that the debate of monitoring racial microaggressions must occur in the public sphere as the private sphere is ineffectual at finding the compatibilities and conflicts of these two freedoms. Moreover, Arendt urges the use of the public sphere because it is the foundation of where a discourse amongst multiple points of view may take place in such a way that they can be analyzed rigorously through the lens of logic and reason. Furthermore, Allen adjusts this notion for social movements for when influential discourse allows “collective-action problem solvers [to] bring about decisions that change the structure of experience for a whole polity,” such as the civil rights movement (Allen 184). The first step in approaching solvency in this debate is for all participants to agree to conduct this conversation in the public sphere rather than the private sphere which does not provide a mechanism for the effective flow of ideas. However, in order to ascertain the most critical aspects at stake in this debate, it is necessary for a contextualizing scene of the public sphere in its current state. The idea of microaggressions is rooted in Professor Derald Wing Sue’s, a social psychologist at Columbia University, article titled “Racial Microaggressions in Everyday Life” in which he argues that “racial microaggressions are brief and commonplace daily verbal, behavioral, or environmental indignities, whether intentional or unintentional, that communicate hostile, derogatory, or negative racial slights and insults toward people of color” (see fig. 2). The term manifested itself in the idea that racism has evolved dramatically since the civil rights era during which outright displays of bigotry were presented. However, more modern conceptions of bigotry “is more likely than ever to be disguised and covert and has evolved from the “old fashioned” form, in which overt racial hatred and bigotry is consciously and publicly displayed, to a more ambiguous and nebulous form that is more difficult to identify and acknowledge” (Sue 271-272). Therefore, it is critical that the role of the university changes its approaches to dealing with modern racism because classical tools for combatting racism such as state-sponsored integration is no longer a tool available in their arsenal. Figure 2. 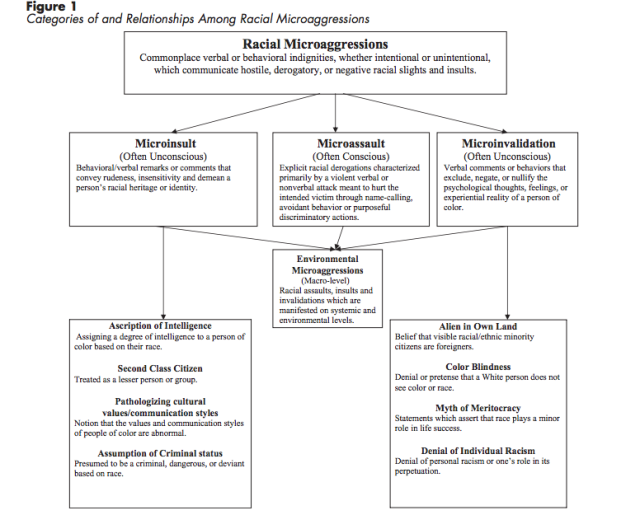 Categories of and Relationships Among Racial Microaggressions. Although the campus protests in the 1960s helped to create specific safeguards for systematically oppressed individuals, universities are having a difficult time with the debate revolving microaggressions as no one policy can address all possible interpretations of a microaggression. Attempts at universities like the University of California, Berkeley and the University of California, Los Angeles, have tried to enact policies like increased faculty diversity training, however, this has not been without harsh criticism. Some opponents like Eugene Volokh, a professor at the University of California, Los Angeles, argues that this policy is not “about keeping classes on-topic or preventing personal insults—it is about suppressing particular viewpoints.” Even more so, he is discrediting several of the microaggressions listed by the UC Office of the President such as “America is a melting pot” or “America is the land of opportunity” (Volokh). In a different vein, Professor Derald Sue “suggests that we leave it to the victims of microaggressions to tell us whether a turn of phrase is or is not an act of aggression.” Whether this is the most equitable solution, however, requires more analysis. This opinion, along with many others must be thrown into the public sphere and the theories must be engaged thorough constructive criticism to seek out the most truth. Thus, I propose that the role of the university is to seek out what Hannah Arendt calls the “supreme blessing of human life, that which bestows significance to the lives of individuals” or her theory of action as the maximum use of human agency (D’Entreves). The universities that are currently at the forefront of the modern racial campus revolution are colleges rooted in the traditional Western conceptions. However, there are compatibilities between the idea of a university’s freedom and its responsibility to engaging in the debate on racial microaggressions. A specific obligation that the university has is to “challenge established orthodoxy” and reevaluate the assumptions of various claims that propagate throughout the academic and social realm of its students, faculty, and administration. Former Stanford University President Gerhard Casper pronounces that the “university is the ally of change, and change is the ally of the university” (Casper). The university must enlarge its capacity to welcome change, if it is needed, and in the context of this social and cultural revolution, the students and administration must be open to reexamine their freedoms of speech. However, this is only a prerequisite for the conceptions of thought proposed by Danielle Allen to ensure a productive democracy. Allen quoting Dana Villa explains that a citizen “develops an examined life…[through] the endless and seemingly circular questioning of the basic terms of our moral culture, those whose meaning seems self-evident and unarguable” (Schlosser 30). The crux of the goal proposed by those who seek to monitor racial microaggressions is to protect the college student’s and faculty’s emotional wellbeing by preventing trigger warnings for traumatic memories. However, there is a failure of this side’s supporters to participate in a critical facet of a university’s freedom. It is imperative in this age, where the university is the center of intellectual fervor, for “a university’s freedom [to] be the freedom to speak plainly, without concealment and to the point—that is, without endless hedging and escape clauses” (Casper). 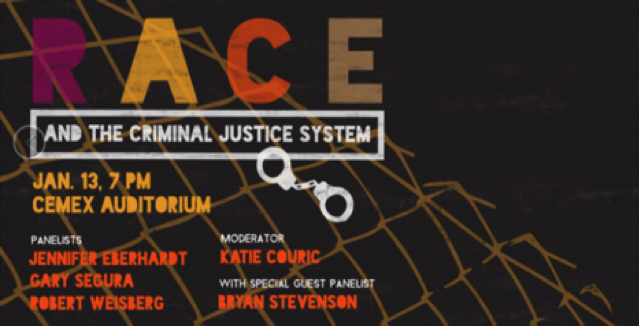 This freedom encompasses the idea that in order for students to feel comfortable enough to engage in intellectual discourse on difficult subjects such as racism and power structures, they must have a safe space in the college setting. However, the mere question of what constitutes a safe space is a conflict within the notion that a classroom is the public sphere. Katherine Byron, a senior at Brown University and a member of its Sexual Assault Task Force, explains a safe space as a place where people who might find comments “troubling” or “triggering” could recuperate. Yet, opponents such as Adam Shapiro, a junior, argued the incompatibility of a safe space and an intellectual space. Although the goal of providing a safe space for therapy “for people who feel victimized by traumatization…sounds like a great mission,” the infiltration of a safe-space mentality into the classrooms makes both professors and students fearful of saying anything that might hurt someone’s feelings (Shulevitz). This idea draws from Jurgen Habermas’ idea of the public sphere and how the classroom should engage in public sphere pedagogy. This method of education “focuses on developing student well-being through purpose-driven dialogue and democratic participation” (Swiencicki 1). The classroom must continue to follow public-sphere pedagogy, especially in times of intellectual and social crisis. Providing an opportunity for students and faculty to engage in a discourse regarding the best course of action for matters involving the future of their educational experience inside and outside of the classroom is critical (see fig. 3). Figure 3. Microaggressions: Comments That Sting. Circumscribing the intellectual debate to be one concerning student-citizens and faculty-citizens forces the incorporation of public sphere accountability in an individual’s private sphere role. While this seems inherently problematic, the model proposed by Danielle Allen to find solutions to this debate on the compatibilities and conflicts of these freedoms will ensure more productivity than the current state of low deliberation. Danielle Allen’s model consists of three major components that guide the course of deliberative democracy which is necessary in mending the disagreements that both sides hold. Deliberation, prophecy, and advocacy are what Allen calls the three tasks of civil agents in order to apply the principle of action in the human world. Deliberation is the idea that when members of a community convene and discuss the variety of ideas present within them through a rigorous process of analysis and criticism, then they will be able to find the best possible course of action. Ideas that derive from a deliberative process develop to become compelling modes of action because the process to resolve such an uncertain issue is often times more important than the solution itself. This idea is rooted in the foundation of the ancient Greeks as Aristotle notes that a community “deliberate not about ends but about the means to attain ends” (Peterman 198). The aim for both sides in this debate is to garner a protection from the racist dogma pervading and persisting in our country’s universities but also to ensure that a university remains the foundation for challenging intellectual discussions as universities are principal actors in the social arena. At Stanford University, a new community-wide and community-driven initiative known as OpenXChange is an ideal representation of deliberation in the context of a university. OpenXChange’s goal is to “push [their] community to consider meaningful interchange and thoughtful listening, as well as mutual respect even around areas of intense disagreement” further “challenging Stanford students, faculty and staff to think critically, investigate, and engage together.” A prime example of an event engaging in the necessary ugliness of current systematic structures is titled “Race and the Criminal Justice System” in which a panel consisting of social justice activists and Stanford faculty members will enable conversation with undergraduate and graduate students about the state of the national justice system as well as ways the university, as an actor in society, may contribute meaningful change (see fig. 4). This idea of deliberation, whether it be through university town hall meetings or casual conversations between two public actors, must be an engaged resource in this process to find the fine line between preserving both freedoms in conflict at this point. The role of advocacy is self-apparent in the realm of social movements that seek to revolutionize the landscape of culture or systematically shift the values in a society. Advocacy constitutes of the work completed in fulfillment of a goal, such as the years of organizing rallies, lawsuits, and huger strikes that the suffragettes did in attainment of the right to vote with the ratification of the Nineteenth Amendment. However, advocacy from the point of view of the youth is particularly engaging in participatory politics. For many university students, their freshmen year is the first time they will be able to provide their choice in the ballot boxes, and this experience is hard to see within the framework of traditional public sphere theory. It is interesting to note that the “youth are often pointing to the importance of issues—like incarceration, food politics, sexual assault, and fluid sexualities—that [have not] made it on to the radar for older people and yet are also defining our socio-political landscape” (Allen). This is precisely the action that university students are engaging themselves with in this debate. The role of the students in this ethical dilemma remains to be a varied voice but ultimately allow for the importance of the issue to plug itself into the national conversation. A similar experience that parallels actions taking place across universities acting on the conflict of microaggressions and free speech is the DREAMers’ collective action. Undocumented students brought to the United States by their parents, some of them college students, engaged in a similar wave of advocacy through social media and political rallies. Allen describes the successfulness of their work, not in the context of the attainment of their goal, but rather in improving the state of participatory politics as “by creating a space of appearance where new forms of action could occur, noncitizens were engaging in acts of political freedom—what Hannah Arendt has described as the capacity for new beginnings.” This emphasis on natality is critical in the conversation regarding microaggressions today because the principle of action is easily practicable since “Arendt’s focus on action…helps to foreground what [Allen] takes to be one of the demonstrations’ most significant aspects: its power as a moment of initiation and an inaugural performance of the political” (Allen 83). Therefore, a second fundamental requirement in the pursuit of finding the truth of the microaggressions and political correctness debate lies in the virtue of advocacy as a task of civic agency. However, the final task of civic agency is still in development for the role of this intellectually social debate as prophecy, the action an actor that prominently influences the course of a political revolution takes, is linked to the continuing births of the movement’s ideas. A prophet in the context of Danielle Allen’s argument of an ideal citizen is an individual or multiple individuals that diagnoses the circumstances of the country, prescribes a course of action, and attempts to shift their values. The most prominent example is Dr. Martin Luther King, Jr., who noted a problem in the “daily ugliness about [this other America] that constantly transforms the ebulliency of hope into the fatigue of despair” while talking about race in the late 1960s (King). His ability to accurately describe the discriminatory actions against black individuals and other people of color in the United States in a poetic language provides him with an outlet to provide his recommended course of action that attempts to dismantle the oppressive structures the country was built on. As an authority of his human agency, King is the epitome of the prophetic task, a virtue that the current movement regarding microaggressions must model in order to find the truthful balance. However, finding the prophetic voice in a revolution takes time to establish itself. Arendt argues that the constant births of people, ideas, and disagreements will lend itself to an eventual revelation, a moment in the revolution where the values are shifted and then starts the strategy to create a newfound space for freedom (Arendt). Ultimately, if the revolution is going to be a means to protect significantly oppressed groups in American universities and ensure the intellectual space to discuss distressing matters constructively, the three tasks of civic agency must be adapted by the university. The necessary deliberation, interested advocacy, and passionate prophecy constructed by Danielle Allen in the intellectual musings of Hannah Arendt remains the best model to guide the process of finding truth. As the revolution continues, however, the model must continue to adapt to the nuances of each passing social movement. Perhaps this pathway to constructive compromise and maximum truth-seeking will allow for the greatest era of meaningful social change. Allen, Danielle S. From Voice to Influence: Understanding Citizenship in a Digital Age. Chicago: U of Chicago. Print. Arendt, Hannah. Between past and Future; Eight Exercises in Political Thought. [Enl. ed. New York: Viking, 1968. Print. “About OpenXChange.” OpenXChange. Stanford University, 9 Sept. 2015. Web. 5 Dec. 2015. “BAASA Rabb Steps Installation.” BAASA Rabb Steps Installation. 1 June 2015. Web. 6 Dec. 2015. “Beyond the Speech: Martin Luther King Jr. Day Challenge | The Dish.” Beyond the Speech: Martin Luther King Jr. Day Challenge | The Dish. 13 Jan. 2012. Web. 6 Dec. 2015. D’Entreves, Maurizio. “Hannah Arendt.” Stanford University. Stanford University, 27 July 2006. Web. 2 Dec. 2015. Haidt, Greg. “The Coddling of the American Mind.” The Atlantic. Atlantic Media Company, 10 Aug. 2015. Web. 30 Nov. 2015. Hodge, Channon, and Tanzina Vega. “Microaggressions: Comments That Sting.” The New York Times. The New York Times, 21 Mar. 2014. Web. 6 Dec. 2015. Luther King Jr., Martin. “The Other America.” A Speech by Dr. Martin Luther King, Jr. Memorial Auditorium, Stanford. 14 Apr. 1967. Lecture. Newman, John Henry, and Frank M. Turner. The Idea of a University. New Haven: Yale UP, Print. Peterman, John E. On Ancient Philosophy. Belmont, CA: Thomson Wadsworth, 2008. Print. Schlosser, Joel Alden. What Would Socrates Do? : Self-examination, Civic Engagement, and the Politics of Philosophy. Print. Shulevitz, Judith. “In College and Hiding From Scary Ideas.” The New York Times. The New York Times, 21 Mar. 2015. Web. 3 Dec. 2015. Sue, Derald Wing. Microaggressions in Everyday Life: Race, Gender, and Sexual Orientation. Hoboken, N.J.: Wiley, 2010. Print. Swiencicki, Jill. “The Town Hall Meeting: Imaging a Self through Public-Sphere Pedagogy.” Ebsco Host, 1 Apr. 2011. Web. 3 Dec. 2015.